“This is a show about death,” promises the cast of Beetlejuice: The Musical at the very top of the show. Death, however, was tertiary to bawdy humor and emotional family relationships in the musical adaptation of Tim Burton’s 1988 fantasy/comedy film about the ghost with the most. Technically, this show was gorgeous. The sets and lighting were beautiful, perfectly capturing the “trippy” feel of a Tim Burton project. Costumes were amazing – Lydia might just be my new style icon. I loved the cast as well – Alex Brightman (School of Rock the Musical) was a gregarious and delightful presence as the titular Beetlejuice, and I was excited to see Kerry Butler (Barbara) return to DC after Mean Girls’ pre-Broadway run last year. 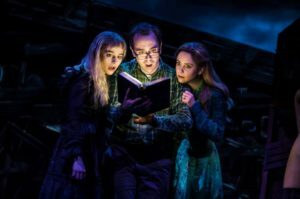 Sophia Anne Caruso was a delight as the mourning Lydia, and made a big splash on stage. And don’t get me started on the choreography – I wanted to get up and dance with the cast most of the time, which is entirely out of character for me and my two left feet. Unfortunately, there were also moments where the show fell flat. Oftentimes, the blocking felt stiff and awkward. The profane humor became old hat quickly; when someone is consistently rude and boorish, it loses the shock value and the laughs become forced. The callbacks to the film were appreciated, but again – too frequent. The audience didn’t need reminders that this was already an incredibly popular film; that’s the whole reason why we were there. And while the show tried to be tongue-in-cheek about the child bride sequence (“Creepy Old Guy”), it still felt icky to me. Fans of the film will feel at home in the theatre, but might notice some rather big changes to the plot. For one thing, Beetlejuice is more than a passing presence in the show. Brightman spends much more than 17 minutes on stage – and I’m so glad he did. Despite his dark and irreverent humor, Beetlejuice is often a breath of fresh air, entirely reenergizing the company. For another, Lydia isn’t simply going through a goth phase in the musical – she’s mourning the recent passing of her mother. Meanwhile, Delia is Lydia’s “life coach” and secretly dating Charles, her father. Confession time: I’m not a huge fan of the movie (nor most other Tim Burton-helmed projects). Maybe that’s why I took to the musical much more than other DC theatre critics. I didn’t always appreciate the crass humor, but was instead most captured by the strong, emotional moments anchored by Caruso’s Lydia. Lydia is mourning her mother’s death and feels like she’s lost her father, too, even though he’s still alive. Act 1’s “Dead Mom” is a strong, powerful song that showcases Caruso’s vocal and emotional range. Her relationship with Barbara and Adam Maitland propels the emotional journey of Act 1 and into the second act, especially as they begin to take a paternal role in her life (“Children We Didn’t Have”). Charles’ redemption arc in Act 2 nearly brought tears to my eyes as he and Lydia finally had a long-overdue conversation (“Emily Would”/”Running Away”). Even Lydia’s relationship with Beetlejuice seemed like a wrong turn in her search for a father figure, which is just one of many reasons why the marriage plotline couldn’t rise above the ick factor. Overall, the musical was a hilariously fun time (as long as you have thick skin and don’t mind a lot of potty humor). Film buffs will rejoice in the “Day-O” dinner sequence and the fun callbacks to the film. However, I don’t see much of a future for this show on Broadway when it opens at the Winter Garden Theater in March 2019. This has the feel of a show which may quickly wear out its welcome in one city, but will live a long and successful life on tour. 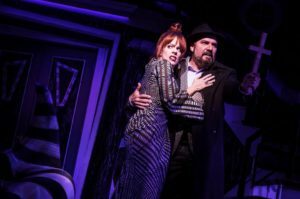 Beetlejuice runs through November 18 at the National Theatre in Washington, D.C. It will open at the Winter Garden Theatre in New York on April 25, 2019. Beetlejuice is directed by Alex Timbers and features music and lyrics by Eddie Prefect and book by Scott Brown and Anthony King.